4000 years ago, a learned Egyptian scribe penned this advice: ‘Do not be proud because you are wise! Consult with the ignorant as with the learned! Perfect speech is more hidden than malachite, yet it is found with the maidservants at the millstones’. While wisdom may be found in unexpected places, unfortunately ignorance may be also. I was disappointed last week when the BBC and the Guardian published articles that inaccurately dismissed hieroglyphs as a more primitive form of writing than emojis. 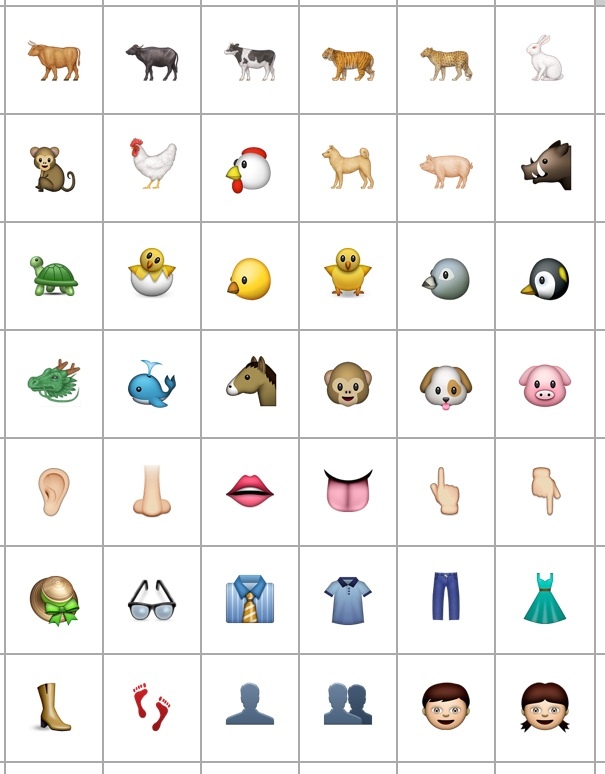 Professor Vyv Evans, Professor of Linguistics at Bangor University, was quoted as saying: ‘As a visual language emoji has already far eclipsed hieroglyphics, its ancient Egyptian precursor which took centuries to develop’. While emojis are a fun and creative method of casual digital communication, they’re definitely not yet on the same level as ancient Egyptian, which was actually a structured, grammatical language capable of communicating complex, abstract ideas. To compare the two, you can look at some fun emoji news headlines that the BBC put together. They manage to convey some very basic ideas, but only really work if you’re already familiar with the news stories to which they allude. 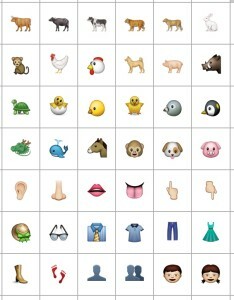 For example, this one which is apparently ‘One in four people don’t know the dodo is extinct, a poll finds. 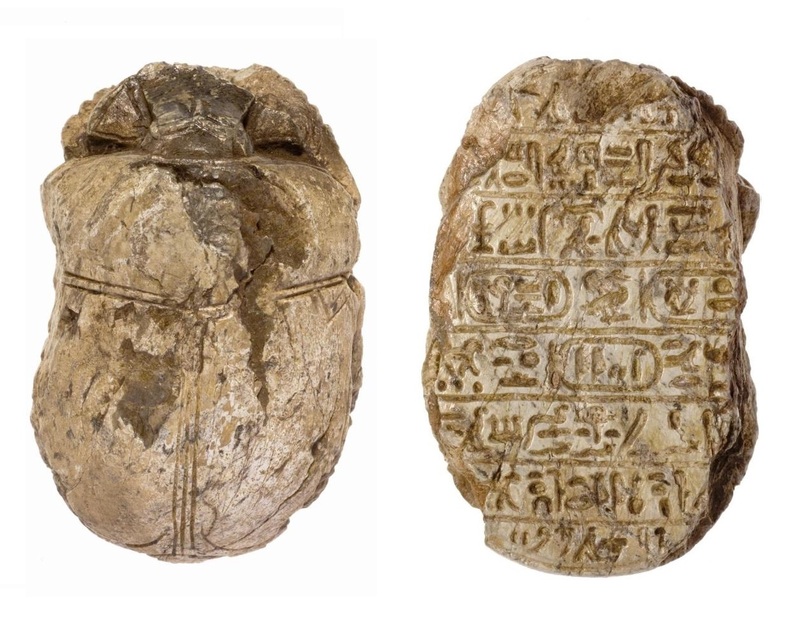 Compare an equivalent ancient Egyptian news-vehicle: the commemorative scarabs of King Amenhotep III. These were circulated with short inscriptions to celebrate the pharaoh’s successful hunts, marriage, and building projects. Much more can be conveyed since the script includes numerals, has phonetic symbols to spell out names, and has a grammatical structure through the use of word order, adverbs, adjectives, and pronouns. This scarab gives the names and titles of Amenhotep III and his wife Tiye and celebrates the fact that between years 1 and 10 of his reign the king shot a total of 102 lions! Glazed steatite scarab incised with the lion-hunt text of Amenhotep III, 18th Dynasty (A.1960.572). Image © National Museums Scotland. Following Evans’ BBC interview, Jonathan Jones wrote a rather scathing blog post in the Guardian, condemning emoji as a sign of modern cultural degeneracy and ancient Egypt as a form of dark ages: ‘After millennia of painful improvement, from illiteracy to Shakespeare and beyond, humanity is rushing to throw it all away. We’re heading back to ancient Egyptian times, next stop the stone age. Such ethnocentric attitudes exhibit a disappointing cultural chauvinism in judging the ‘evolution’ of other societies by Western values. But it’s not entirely surprising. 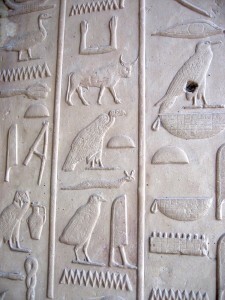 Even the misinterpretation of hieroglyphs dates back to ancient times. 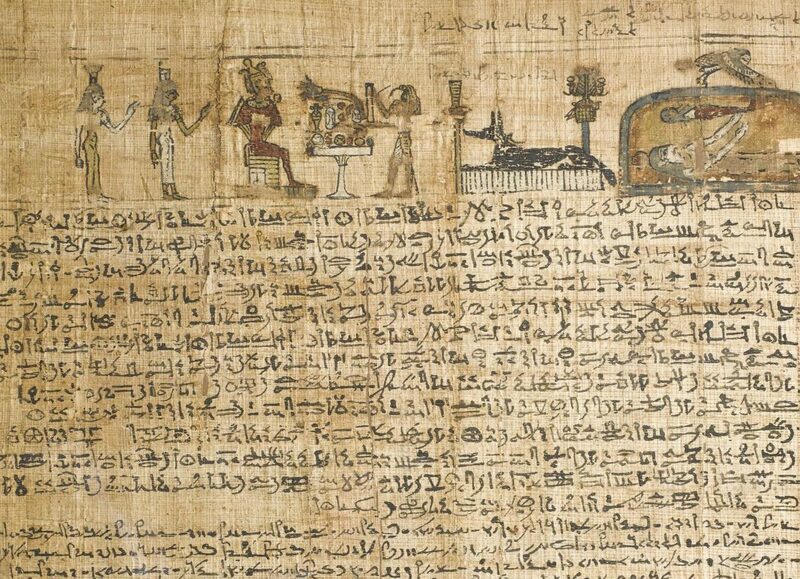 After Egypt had been absorbed into the Roman Empire, the last known hieroglyphic inscription was carved by a priest on August 24, 394 AD on the island of Philae, and the script was subsequently forgotten. 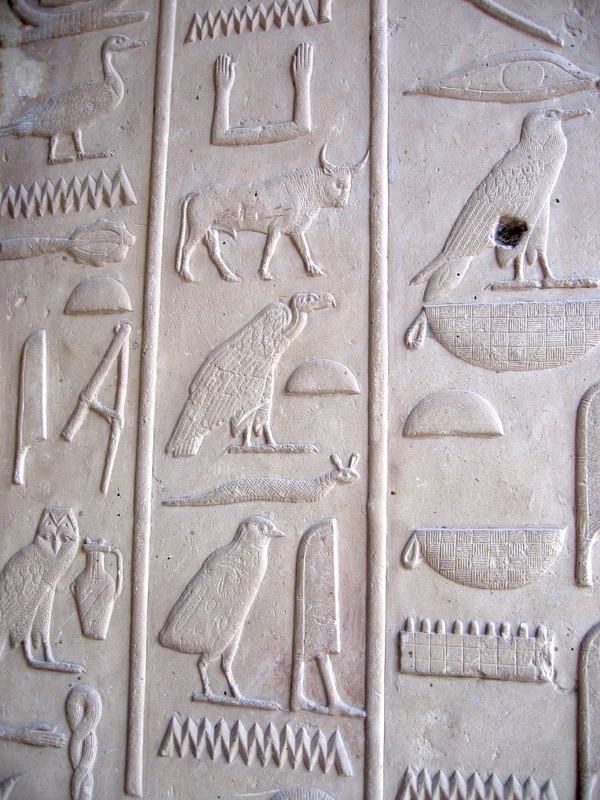 The misconception of hieroglyphs as ‘picture writing’ began with the 4th century Greek grammarian Horapollo, who encouraged speculation about their mysterious symbolic significance. It was not until the rediscovery of the Rosetta Stone in 1799 and the decipherment of hieroglyphs in 1822 by Jean-François Champollion that script was finally understood again. Hieroglyphic symbols don’t simply function as pictograms that stand for what they depict. Some do, but most symbols actually hold phonetic values and represent sounds. Often symbols have multiple functions depending on their context. For example, the ‘house’ hieroglyph can be used as a pictogram to write the word pr, meaning ‘house’ (left below), but it also holds the phonetic value pr, which can be used to write other words, such as pri, meaning ‘to go forth’ (right below). History is in the making, but can we piece it back together again? It is hard to believe that only a week has passed since I initially wrote my last post in response to the images of damage at the Egyptian Museum. Over that period of time, many of us who blog about ancient Egypt have been caught up in the panic of trying to assess the antiquities situation despite the difficulties of communication. But it hasn’t been worrying over the antiquities that has kept me up at night. The scenes in Tahrir Square and the streets of Alexandria have never left my mind. On the Berkeley Blog, Rosemary Joyce urges us to keep everything in perspective. 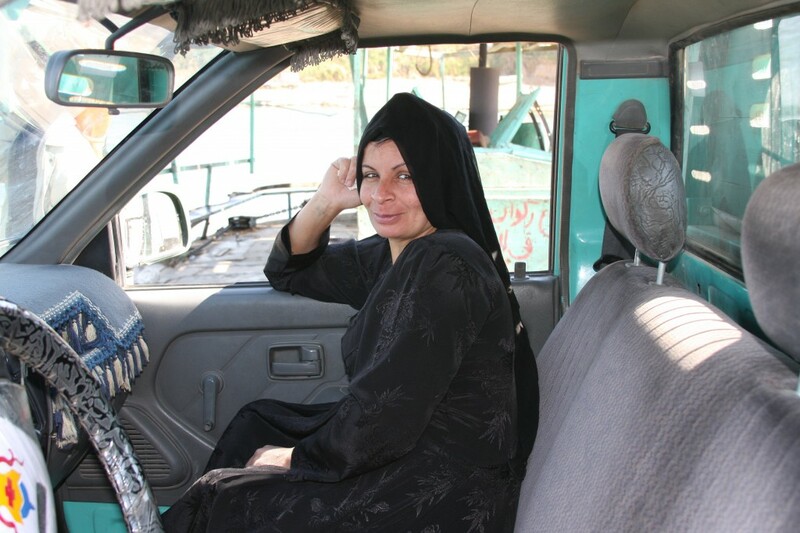 I have always loved my time spent in Egypt, visiting the monuments, working on sites, and living with local families on farms and in small villages and getting to know the people, from antiquities inspectors to local shopkeepers. Somehow though, I never quite realised just how much I love the country and the people until these past few days. No one who has worked in Egypt is surprised by the brave actions of the ordinary Egyptians and SCA officials who have stood guard over their heritage, but their actions are still powerfully inspiring and give great hope to all who have been concerned over the future of Egypt’s past. 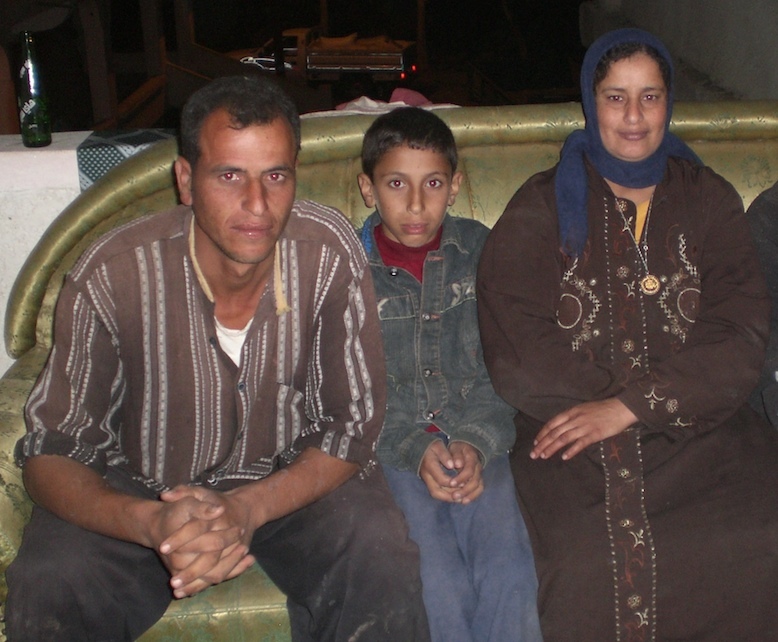 Finally stories are emerging from Egyptians themselves and they should be celebrated. Ramadan B. Hussein, who works for the Supreme Council of Antiquities, posted his take on the museum break in and the efforts of locals around the country on Facebook (reproduced below). 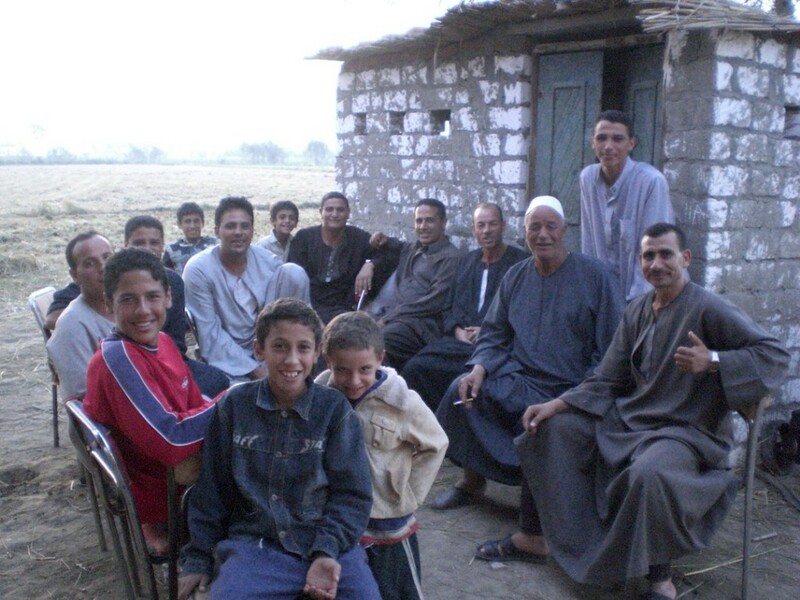 A moving story of locals in Luxor protecting Karnak temple was posted on the Looting Database and conveys their passion. A post from Francesco Tiradritti from the Italian Mission to Luxor also gives an account of the locals protecting Karnak. Also, the youth of Alexandria banded together to protect the great library there. It is terrifying to imagine what the worst case scenario could have been, but it is because of the people of Egypt that it did not come to pass, indeed, could probably never happen because of the love and pride that so many people there feel for their heritage. But can we now piece history back together again? Can the damage truly be undone, and can we ever recover what has been lost? Some people have been commenting, blaming Egypt for allowing this to happen, but we should also remember the damage done by early archaeologists in their often destructive hunt for valuable antiquities. In my current PhD work, I found that a number of the wooden models I’d wanted to study, similar to those of Meseti’s that were damaged in Cairo, no longer exist. They were housed in the museum at Liverpool, and during World War II they were destroyed by the bombing. All I have to work with is a couple of insufficient photos. Other models that were excavated in the 19th century do not have any recorded location and seem to have vanished without a trace. Objects that are lost are not not only lost in terms of something beautiful to look at, but as a source of knowledge for future generations. People often think that once a tomb’s been discovered or an artefact’s been found and put in a museum, that’s the goal achieved, it’s purpose fulfilled. Someone must have thoroughly recorded and studied it at some point, right? Not necessarily. Especially with sites excavated in the 19th and early 20th century, so many tombs and artefacts were discovered in a short space of time with less than rigorous recording. Many objects in museums have barely been looked at, let alone been part of a focussed study. Even the treasures of Tutankhamun, which I expect people will assume are some of the best known artefacts from Egypt, many of them have not yet been properly published at all. And even if objects and sites *have* been looked at in a number of detailed studies, focus of investigation can evolve over time and details that were overlooked in the past can become important for new avenues of understanding. 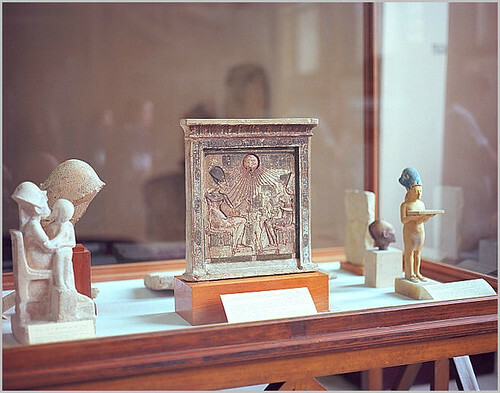 What has happened at the Egyptian Museum in Cairo is a reminder to all of us to never take for granted what we already have in the glass cases and storage rooms of our museums. These objects are ripe for study and the stories they can tell us have not yet been exhausted. As tantalising as it is to find the next great discovery hidden in the sands of Egypt, we must not ignore what we already lucky to have. Usually whatever has been guarded by the sand for up to the past 5000 years is fairly safe there, but as well as museums and excavated tombs being targeted, the reports of widespread illicit diggings going on at Saqqara and perhaps to a lesser extent in the Fayum and elsewhere, suggest that Egypt’s undiscovered heritage is threatened as well. I am constantly surprised by how often I get asked by people, ‘is there still anything left to be discovered in Egypt?’. Considering that millions of people lived and died there for over 3000 years, there is still plenty to be found. A town and temple site excavated over almost a decade would probably uncover less than a 10th of what’s actually beneath the ground. Even if the random diggings of uninformed looters fails to uncover the statues and golden treasures they’re looking for, the potential damage could hurt our understanding of the day-to-day use of the site and how it evolved over time. One of the sources of the problem with looters right now is sadly a legacy of the early days of European treasure hunting in Egypt and the global obsession with ancient Egyptian gold. 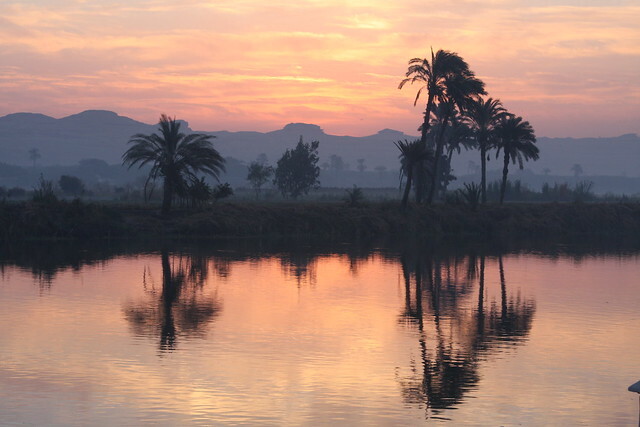 Many Egyptians in rural areas believe that modern excavation is still an aim to find gold, rather than a desire to better understand the lives of the ancient Egyptians. Today, our knowledge is better served by finding mud brick walls, seal impressions, scrawled notes on broken pottery sherds, and analysing soil samples. More work needs to be done to educate local populations about local history and the current aims of modern Egyptologists. Some excavation projects already do this, for example the British Museum excavation at Kom Firin shared information about their work through leaflets made available in Arabic. More of this should be encouraged. We are still waiting for more thorough news from across Egypt- there is reason to be concerned about the situation there but also much reason to be hopeful. My thanks go out to the people of Egypt for their protection of the past, as well as my thoughts and prayers for their future. Dr. Sarah Parcak has posted another update from Dr. Salima Ikram on the Facebook group Restore + Save the Egyptian Museum. Dr. Ikram states that the damaged mummies were Late Period fragmentary mummies used to test the CT machine. Dr. Zahi Hawass has issued another statement on his blog, again reassuring everyone that Saqqara is safe, including the tomb of Maia, and that the Memphis Museum was not looted, which is wonderful news. He also confirms what Dr. Ikram said earlier today that the mummies were not royal but fragmentary ones used for CT scans. There is also an article from a National Geographic reporter who was given a tour around Saqqara to show that everything there is indeed safe. He was shown the entrance to the tomb of Maia, now bricked up for safety, and was assured that the tomb of Maya is also safe. To guard against any potential future problems with illegal antiquities smuggling, Rick St. Hilaire, a cultural heritage lawyer, has written a helpful guide to US Seizure Laws and How to Make a Report to Customs and Border Protection. If you’re in the US and come across anything suspicious, just fill out the secure form at https://apps.cbp.gov/eallegations/. You can also make a report by telephone by calling 1-800-BE-ALERT. The International Archaeological Community has also issued a statement calling for measures to be taken to protect Egypt’s archaeological heritage. Dr. Zahi Hawass was on the Andrew Marr show on the BBC this morning. If you’re in the UK, you can watch it on iPlayer here at the 30min mark, otherwise a transcript should be posted sometime soon here. A short summary can be found on the BBC’s live updates page. 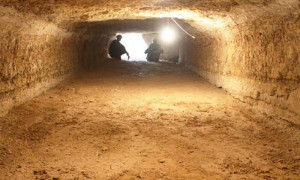 An article by ‘Archaeology’ correspondent Mike Elkin, says that a member of the French mission at Saqqara has stated: ‘People were saying that my site in south Saqqara was destroyed, but in reality only two tents were damaged’, although other archaeologists there say ‘added that storage facilities were robbed’. Miriam Seco, director of the excavation of the Temple of Thutmose III in Luxor, says “I’ve been in contact with the curators at the Cairo Museum, and many are sleeping there at night. The army is outside, but they are staying there to protect the antiquities. In Luxor, there were warnings on January 29th and 30th about armed looters so all the Egyptian archaeologists, who live on the East Bank, crossed the river to take turns standing guard with sticks and anything else to protect the sites. Thank god there were no such attacks.” Seco said that missions pressing on with work include Chicago House in Medinet Habu, her excavations at Thutmose III’s temple in Luxor, a French team at Karnak, and the Polish team at Deir el Bahri. une chose inouÃ¯e se produire: les pilleurs se sont prÃ©cipitÃ©s. something incredible happen: the looters rushed. Ahram Online reports that the roughly 70 damaged objects from the Egyptian Museum are due to be repaired soon and back on display. On another note, I went to the Egyptian museum today with reporters from the Wall Street Journal and other newspapers. We reviewed every smashed vitrine. 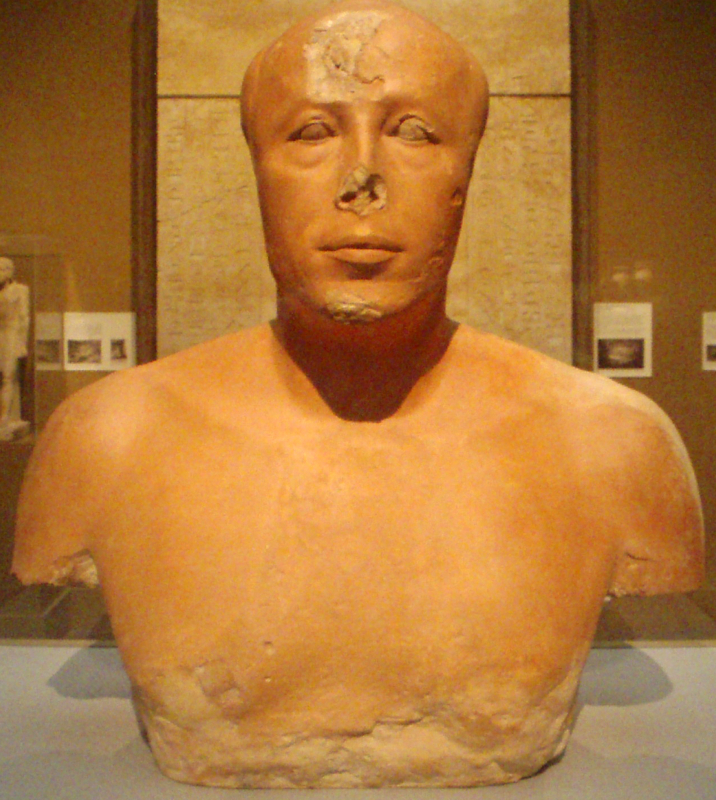 One showcase in the Amarna galleries was smashed; it contained a standing statue of the king carrying an offering tray. While the showcase is badly damaged, the statue sustained very minor damage and is repairable. 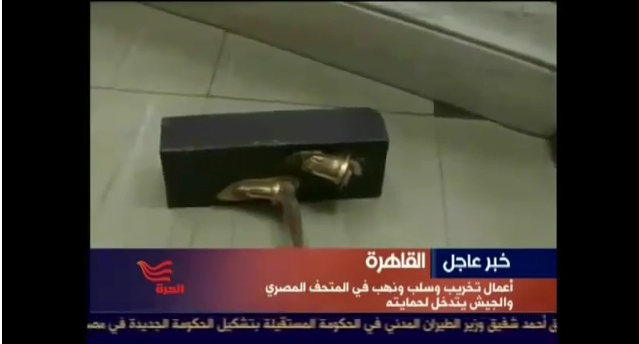 Another vitrine that was smashed contained one of King Tutankhamunâ€™s walking sticks. 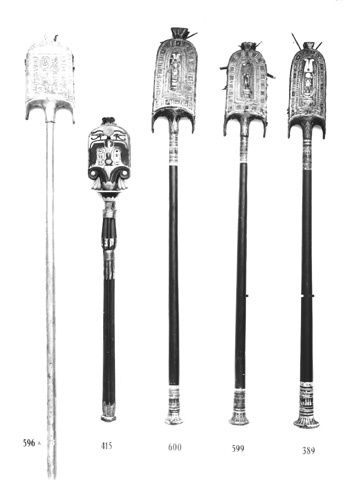 The gilded stick is broken into two pieces, and can be restored. 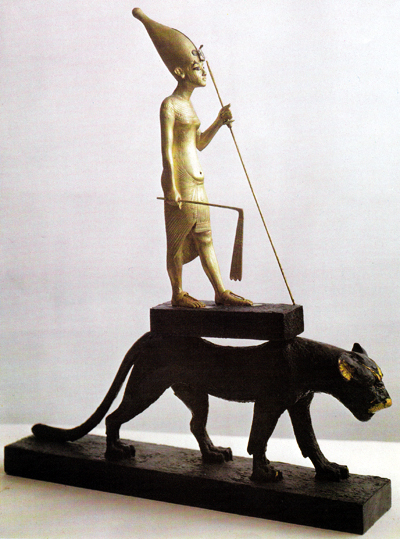 The other King Tutankhamun object that was damaged was the wooden statue of the king standing on the back of a panther. The reference to the statue of Akhenaten carrying an offering tray would suggest that it *might* possibly be this small statue on the left from the Egyptian Museum that has been slightly damaged. Luckily it sounds like the damage is minimal. A National Geographic article says only 20-25 objects damaged at the Egyptian Museum in Cairo rather than 70, which is great news. 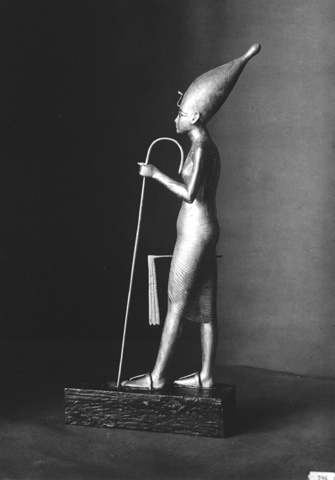 Damage to the gilded statue of Tutankhamun on the papyrus skiff is also confirmed. 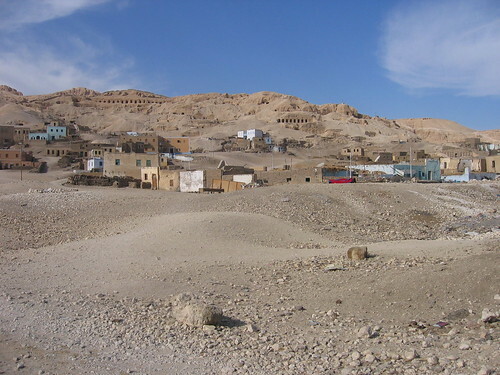 From January 29, a lot of people attacked the antiquities area, from Abusir North to Lisht. Although many tombs and magazines were opened, few things were stolen. Some destruction happened, but not too much, because the stupid robbers searched only for gold and precious things and were not interested in limestone blocks. There was a lot of pit digging in the whole area, but generally this caused no problems. The Dutch site is o.k., except that the magazines of pottery, small objects and bones in the tombs of Maya, Horemheb and Ptahemwia were opened. We closed them again, the wall reliefs are o.k, and nothing was stolen or plundered or damaged. We try to save the sites and do some protection, then later we shall arrange some committee to account for the magazines of Saqqara. We know from other reports that the local inspectors fought very bravely to protect the site and want to thank them and the Egyptian army for their efforts. Whether indeed no damage was done remains to be seen. The main thing is that the precious reliefs seem to be safe. We suppose that objects in the magazines cannot have escaped damage or destruction, and that there will be some loss of archaeological information. However, most of the remains kept there have already been studied by the expedition and we hope that the losses will be minimal. We shall try to inspect the situation in person as soon as everything has calmed down in Egypt. I have also been wondering whether the travertine calcite (alabaster) object shown in the al Jazeera footage might be one of the lids of Yuya and Tujya’s canopic jars, seen here as displayed in the Egyptian Museum. The shape and the dark lines at the front that would correspond with the eyes seem to fit. This photo shows one of the lids from above. This is very speculative though. Thankfully, whatever it is it doesn’t look damaged in the footage, and hopefully nothing else from that case is either. Some young Egyptologists now manage a control room in the antiquities department, responding 24 hours a day to any break-in reports from the country’s 42 museums, and other sites. Each location checks in every three hours.The room has direct lines to the branches of the military and police that have been used 17 times, according to one official. On Monday, there were a handful of reports of unauthorized digging at archaeological sites. In the article, Dr. Hawass says of the looting of the museum’s gift shop: â€œThe funny part of the story is that only the books of the gift shop remained untouched. Looters are never interested in books, I guessâ€. Iâ€™ve always been afraid this would happen. All we can do now is look on and weep. I would once again like to say that the rumors claiming that the tombs of Maya, Nefer, and the Two Brothers in Saqqara were recently damaged are not true. 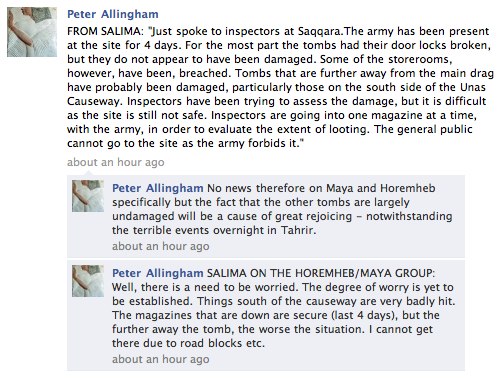 The Imhotep Museum and the storage magazines of Saqqara are also safe. Sorry for the delay in updates everyone- I still have PhD research and teaching to do despite everything! And a huge thank you again for everyone who has contributed comments to the discussion and to what we know about the ongoing situation. There have been more contradictory, unverified reports of looting or lack thereof, this time in Kharga Museum. 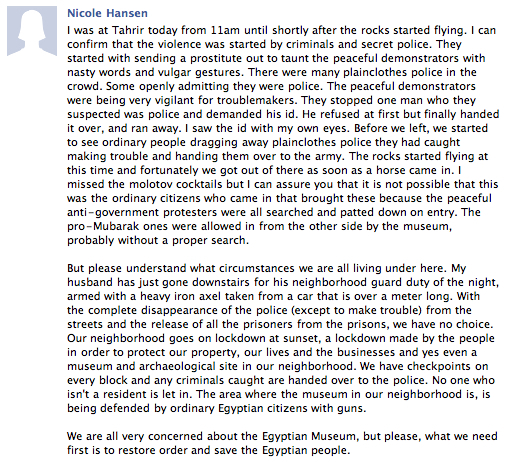 Posts from three local Egyptians on Facebook and Twitter suggested attacks on the museum and looting. However, Dr. Salima Ikram says that despite violence in the area and threats to the museum, it had not in fact been looted: “Kharga: police station attacked because police killed 5 people there. Hospitals busy with this there and in Asyut. Apparently all the magazines and museum and Hibis et alli are safe. In the absence of police etc, thieves and robbers are around. Potentially attacking houses and maybe this will extend to antiquities. However, all the inspectors and the people are patrolling the areas trying to keep everyone and everything safe. Will report further in the morning. S”. 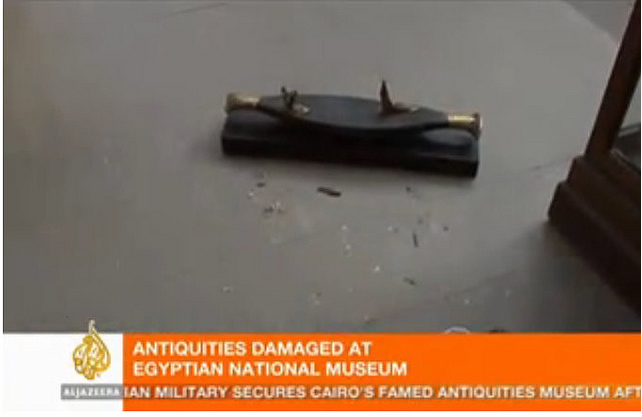 An article in Ahram Online (via Andie Byrnes) says an official statement denied any damage to the museum. An article in Al Masry Al Youm says that the museum in Asyut is a target of people’s anger with the government but doesn’t specify what form that anger has taken. There is no direct reference to looting or damage though. Dr. Hawass has posted again on his blog and states that five more stolen Qantara objects have been recovered. Another National Geographic article again reiterates that the tomb of Maya the treasurer is safe, while the tomb of Maia the wet nurse is completely bricked up. There are also lots of photos and footage from various sources of the ongoing restoration work in the Egyptian Museum. I will comment further on these in the next day or two. Here are some photos from the BBC. For the latest updates, see the new blog post. 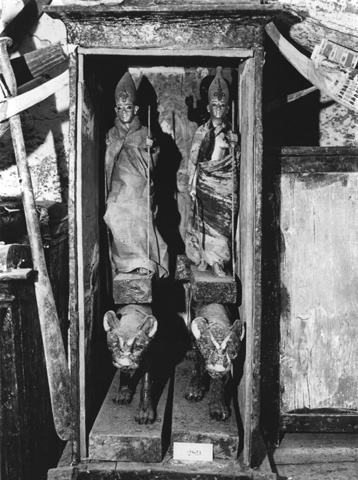 UPDATE Jan 30th, 12pm: the mummies of Tutankhamun’s great-grandparents damaged? UPDATE Feb 2nd, 12:45am: Facebook group Egyptologists for Egypt says reliefs from the tomb of Maia at Saqqara hacked out EDITED-Maia or Maya? Middle Kingdom models of daily life and their have been smashed. The damage on the famous army of Mehseti doesn’t seem to be too severe thankfully, but other beautiful models are broken and strewn on the floor. It is an incredibly sad state of affairs as we await news of the full extent of this destruction of history. UPDATE: I’ve now identified the smashed wooden boat as also belonging to the tomb of Meseti at Asyut (Cairo 4918). It’s one of the largest model boats in existence, measuring over 1.5 metres, and it dates to approximately 2000BC, so over it’s 4000 years old. Very sad. Here’s a photo of it from it’s original publication back in 1913, but you can also follow this link to see a photo of it as it looked in the museum. 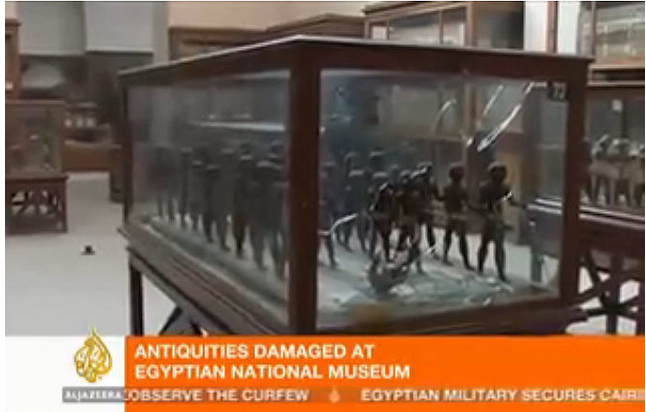 UPDATE: Watching the actual video footage of the museum from Al Jazeera, I regret to say that I think you can spot at the 1 minute mark (see a screen capture and the video itself below), footage of another destroyed statue of Tutankhamun, one of the two statues depicted below (photos care of the Griffith Institute Archive‘s Tutankhamun collection). Amendment, Jan 31st: it appears that these gilded sandaled feet also belong to the panther statue. See update from Jan 31st, 11am below for further info. For a colour photo of these statues, see these photos from the blog of Richard Seaman. In the comments, Tamakazura has correctly identified the gilded open work cartonnage case shown on Al Jazeera as belonging to Tjuya, mother of the great Queen Tiye and great-grandmother of Tutankhamun. Below you can compare a photo from The Complete Valley of the Kings, p. 176 and the still from Al Jazeera. The case was placed directly on Tjuya’s body, so it is doubtful that it could have been removed without damaging her mummy. This suggests that the two mummies mentioned by Dr. Zahi Hawass as being beheaded and severely damaged may be those of Yuya and Tjuya. Aiden Dodson has been able to confirm that the case was displayed separately from Tjuya, so her mummy has not been damaged. They are important historical figures as well as two of the best preserved mummies from ancient Egypt, so it would indeed be tragic if this is true. 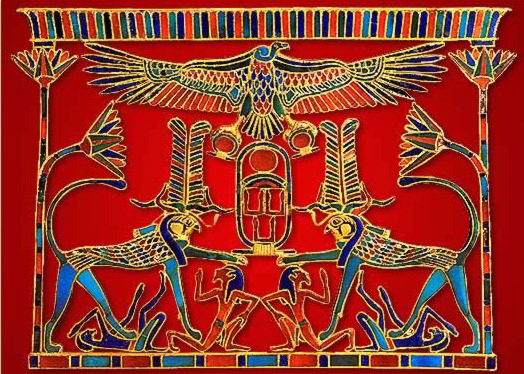 I hope that the incredible burial assemblage found with them, one of the most celebrated discoveries in Egyptology, has not suffered also. The gold fan head featured in the Al Jazeera footage appears to be a fan belonging to Tutankhamun. Here is a photo from the original excavations courtesy of the Griffith Institute- the fan in question is on the far left- and a screen shot of the fan lying in the museum. At least it appears that only the shaft has been broken off and the decoration has been left intact. Dr. Zahi Hawass, Secretary General of the Supreme Council of Antiquities, has confirmed damage to at least one statue of Tutankhamun. I fear it may be more, but I hope that Dr. Hawass is correct that the damage is minimal. At least his comments are reassuring about the current security situation at the museum, as well as some inspiring words for the Egyptians who attempted to protect the museum. Zeit Online (in German and translated into English) has posted an interview with Wafaa el-Saddik, the director of the Egyptian Museum up until very recently, who says that 13 cases have been smashed, some objects have definitely been stolen, the looting of the museum was an inside job by guards and police, and that the museum in Memphis has also been looted. I should also mention that this Al Jazeera screen capture shows a soldier uprooted from the great model army of Meseti, from Asyut, which I mentioned above. 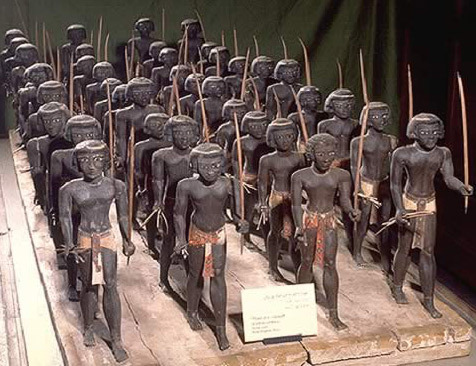 At least four of these figures appear to have been torn from the 4000 year old model. In the comments, Mellady mentions that two of the gilded Tutankhamun statues, which are mentioned above shown wearing the crowns of Upper and Lower Egypt (the ones *not* on the papyrus boat or the panther), are probably still on tour in the USA with the ‘Tutankhamun and the Golden Age of the Pharaohs’ tour. You can see photos of the statues in questions on at these exhibition links. The exhibition was just in New York until January 17th, 2011, and it’s due to open again in St. Paul, Minnesota on February 18th, 2011. If you factor in the time needed to move the objects and set up the new exhibition space, they must be in one of those cities. I have contacted the exhibition organisers to see if I can confirm this. This would suggest that the broken sandalled feet shown in the Al Jazeera footage belong to the figure of Tutankhamun from the panther statue. Other objects shown in the footage but difficult to specifically identify appear to include a smashed shabti figurine, a bronze statuette of the Apis bull, a travertine calcite (alabaster) vessel, faience jewellery, and a faience hippo figurine from Lisht. The large wooden statue shown in the screen capture below comes from the Meseti boat model. Another model figure shown in the footag, kneeling and armless, also appears to be from the same model. There are worrying reports of archaeological sites and museums around the country being targeted but no concrete information as of yet. Nevertheless, I am still inspired and awed by the valiant efforts of ordinary Egyptian citizens taking a stand to protect the heritage of which they are so proud. For whatever damage has been done, it’s possible that it could have been much worse without their help. My focus on this site is on the artefacts because that is what I’m best able to comment on, but my thoughts are with the Egyptian people. Via Kate Phizackerley: there is now a photo, purportedly from the Associated Press, showing two damaged mummy heads, posted on this site. I’m not sure about the source of this photo, but the mummies don’t look particularly like Yuya or Tjuya. It’s possible that severe damage has may them harder to identify, or we could be dealing with different individuals. Also, Dr. Zahi Hawass has reportedly been appointed to the new government position of Minister of Antiquities, and Gaber Asfour has been named Minister of Culture. Raw video footage that has emerged on youTubeis no longer on youTube showing more images than first seen on Al Jazeera, including the gilded figure of Tutankhamun from the panther statue, lying in another case at the 0:50 mark. This confirms that the statue was not removed from the museum at the time of damage. There are a number of reports out there, from various people such as an Egyptian antiquities inspector and Professor Miroslav BÃ¡rta, suggesting that there may have been a fair amount of damage at Saqqara & Abusir. However, we don’t have much concrete information yet. Dr. Hawass has stated that while tombs have indeed been broken into, nothing has been taken damaged. Vincent Brown’s Talking Pyramids site has a very good compilation of all these reports. In terms of following future stories about the archaeological situation in Egypt, Kate Phizackerley has set up a database of information on sites and museums. 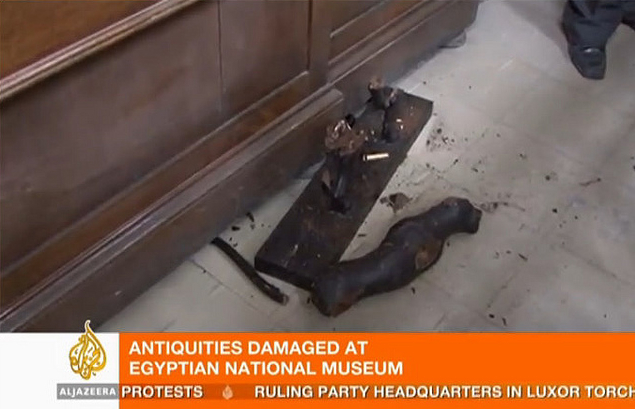 In the comments, Nicko kindly directed me to some new AP photos of damage in the Egyptian Museum. 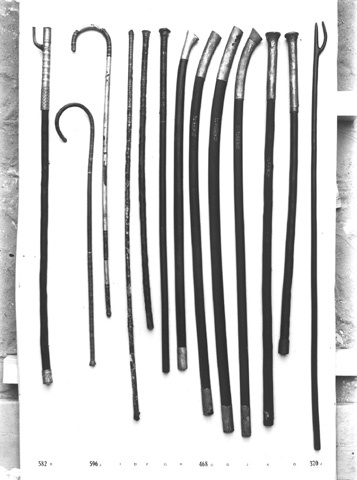 The two new images appear to show a smashed and emptied case in the foreground with a few gilded canes and sticks lying on top. 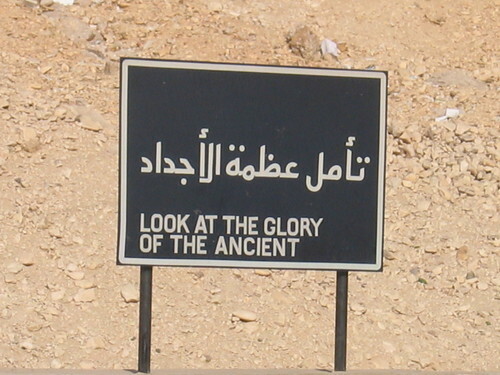 In the background, you can see the display of chariots and off to the right, the huge golden shrines of Tutankhamun. National Geographic now has a higher resolution version of one of the photos, which shows that Tut’s gold fan mentioned above is also lying on top of the case. 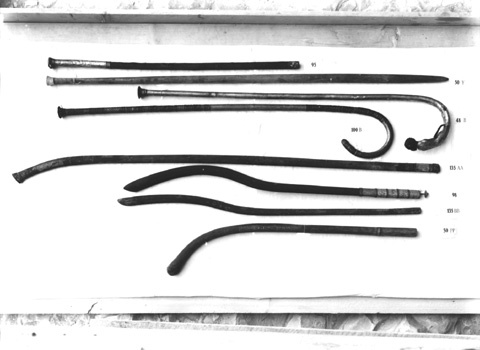 A large number of staff, canes, and sticks were found in Tutankhamun’s tomb, shown in the following photos from the Griffith Institute Archive, and it is possible that some these are shown in the images. I would also like to thank everyone who has contributed to the discussion in the comments and I’m sorry I haven’t had the time to reply to all your remarks! Dr. Zahi Hawass, Egypt’s Minister of Antiquities, released another statement earlier today stating that 288 objects stolen from the magazine in Qantara have been returned. [Considering the magazine reportedly contained 3000 objects, this may not be the best news] He says that 70 objects in the Egyptian Museum suffered damage, including the Tutankhamun panther statue, but it should be possible to repair them. He notes that most of the damage was done because the looters couldn’t see what they were doing in the dark. He says that all other museums and sites are now safe, being guarded by the army and also local Egyptians. UAE newspaper the National also has varying reports about possible damage at Abusir and Saqqara. A rather sensationalist article in the British tabloid the Sun has reported extensive damage at Abusir and in the magazine in Qantara. Overall, there are very worrying reports, especially from Saqqara and Abusir, but also reassurance about many other sites. Human Rights Watch’s emergencies director Peter Bouckaert is reported to have stated that some of the looters at the Egyptian Museum and elsewhere were found to have been carrying police identification cards. A further approximate 50 individuals have been detained by the army trying to break into the museum. This information does not make it clear whether the tomb referred to is that of Maia, wet nurse of Tutankhamun, or that of Maya, the Overseer of the Treasury and Overseer of Works under Tutankhamun. I originally assumed because of the spelling that it was more likely to refer to the lady Maia, but I should stress that with very little information so far, we cannot really be sure. Because of the comments on the damage by the Dutch Mission it seems more likely that Maya’s tomb is the one that has been hit. I’m posting information about both tombs below until we can get any further news. Either way, if the reports are true, then it seems that artefacts from that particular period of Egyptian history have suffered especially. 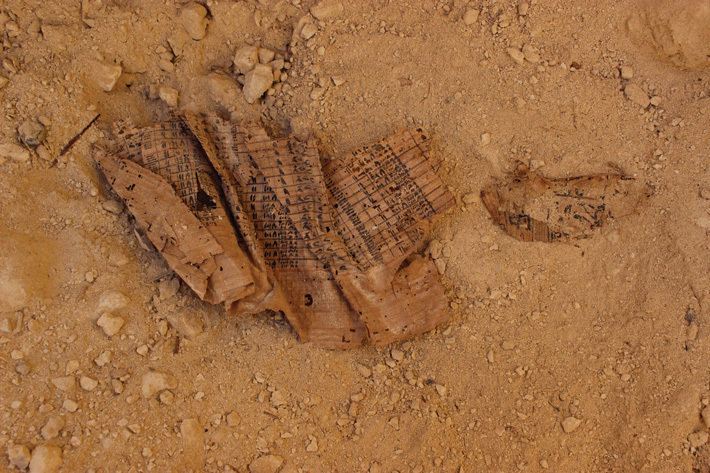 I suggest following the Egyptological Looting Database for further updates on the Saqqara. The tomb of Maya and his wife Merit was originally discovered by Lepsius in 1843 and then lost until its rediscovery in 1986 by a joint mission of the Rijksmuseum van Oudheden and the EES. Maya served under both Tutankhamun and Horemheb. 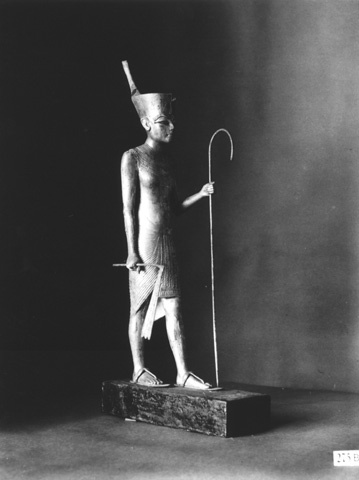 Maia was the wet nurse of Tutankhamun and a high ranking woman. Her tomb was discovered at Saqqara in 1997 by Alain Zivie and the French Mission (info in English). The following video shows scenes from the tomb of Maia with Alain Zivie. No further news of sites being attacked today, hopefully this is a good sign, but there have been a few note-worthy posts on the Facebook group Restore + save the Egyptian Museum, which I’d recommend following for updates directly from Egyptologists, some relayed from the field. I’m posting screen captures of them below: another report of Saqqara looting, a pledge by Dr. Salima Ikram in Egypt to gather further info about sites, and an impassioned plea from Tahrir Square by a member of the group. Also, the IAE has posted this statement and Dr. Mark Lehner, director of the Giza Plateau Mapping Project, is still planning to head out to Egypt next week. Dr. Zahi Hawass has posted another statement reassuring everyone about the safety and security of the museum and other sites, and has uploaded photos from the museum showing the heavy security in place. Dr. Hawass also expresses his frustration with reports of damage elsewhere, which he insists is not true, including Saqqara. I hope he will understand that the only reason everyone is concerned about possible damage is because of our love for Egypt and its incredible antiquities. The photos on Dr. Hawass’ site also include a new image of one of the damaged mummies’ heads (still unidentified) and the broken vitrine with the fan and canes. A story from the Times of Algeria posted by Kate says that two pharonic statues were found in the possession of four individuals who have now been arrested. There are no images or further details so the identification of the statues might not necessarily be accurate. Two reports from CultureGrrl and Science said to be from unnamed Egyptologists say that there has been a lot of damage in Saqqara and Abusir, while another statement from Dr. Zahi Hawass says that the reports are untrue. A report from the Hungarian team at Lahun says there has been some illicit digging in the Fayum area but an attempted looting of Karanis magazine was stopped by the SCA and local Egyptians. The story from Algeria yesterday about smuggled stolen Egyptian statues being found turns out only to involve fakes, which is apparent from the new photo that has been posted. With all of the ongoing change happening in Egypt right now, there is the danger that what has existed there for millennia could be lost in just a moment. The people have been fearlessly standing up and making their voices heard, but the fire and chaos in Cairo is threatening the Museum of Egyptian Antiquities. Reports coming in via Twitter told of the protestors forming an incredible human chain around the museum to protect it until the army could come to take over. 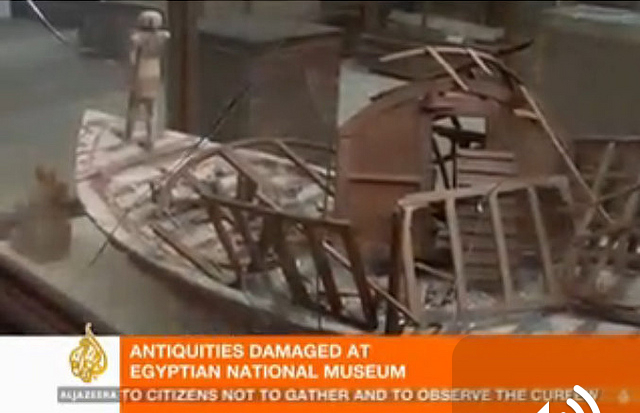 Now tweets are reporting Al Jazeera showing scenes of looting within the museum. The sad news has come of Dr. Zahi Hawass confirming damage and the destruction of at least two mummies. With the continuing upheaval, I am fearful for both the people and the vast repository of beauty, wisdom, history, and monumental human achievement concentrated in that one building. Many know the museum as the home of Tutankhamunâ€™s treasures, the single greatest collection of burial goods from ancient Egypt, including not only the gold mask, but everything from chariots to underwear. But the museum holds so much more. To any student of Egyptology who visits for the first time, the experience is mind boggling. Object after object is a masterpiece, telling fabulous stories of the birth of civilization, genius architects, powerful kings, master artists, great generals, eloquent writers, and the ordinary people who lived and died on the banks of the Nile. From the serene beauty of the statues of King Menkaure or the dazzling treasures of Tutankhamunâ€™s grandparents, to the delicate perfection of the painting of the Meidum geese or the exquisite Middle Kingdom jewellery, copied by Art Deco jewellers. Papyrus Boulaq 18 records the day-to-day working of an ancient Egyptian palace, including the wages that were paid, while the actual beautifully decorated floors from the palace at Amarna, on which Akhenaten and Nefertiti would have walked, are also preserved in the museum. 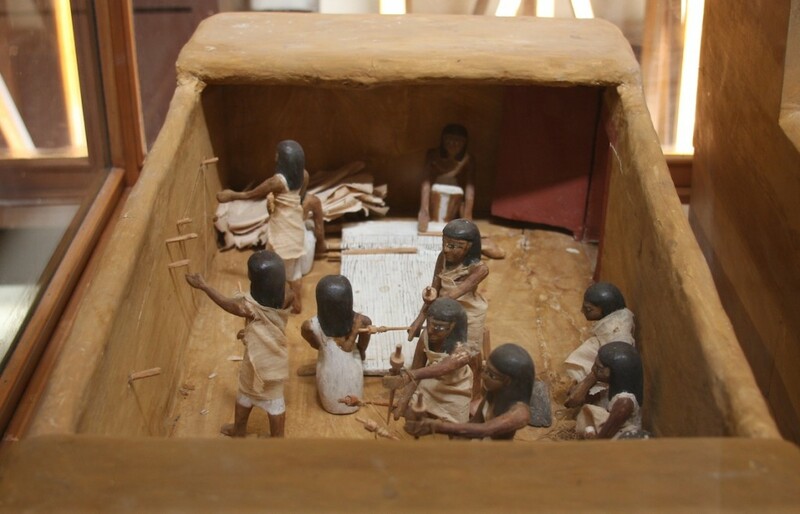 The magnificent models from the tomb of Meketre come from another time of transition in Egyptian history. Meketre served the king who managed to reunite the country after its first long period of decentralization. 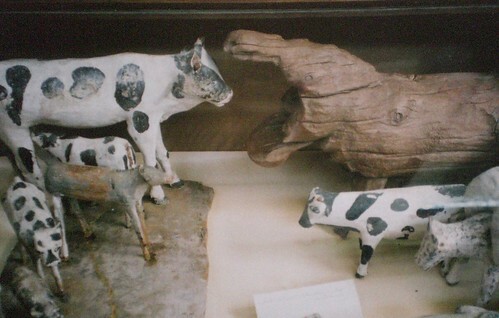 The enormous wooden model depicting cattle stocktaking is absolutely unique in ancient Egypt. The amount of detail in this, and other models, give us insight into daily life, ancient technology, and social relations. Even the bodies of the pharaohs themselves lie in state in the museum, like Ramesses III, who battled invasions by the Sea Peoples and whose wife, son, and officials conspired to assassinate him. What I am possibly most afraid for though is all the unknown, undocumented treasures that lie buried in the basement of the museum. 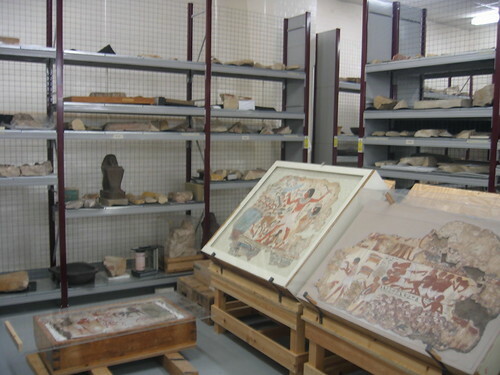 Most museums only have a few percent of their entire collections on display, but in the Egyptian Museum the number of artefacts in storage is so vast that no one entirely knows whatâ€™s down there. There are often stories of amazing artefacts being â€˜rediscoveredâ€™. The first 30 seconds of the video below gives just a glimpse of the labyrinth of objects that lies below the museum. If anything were to happen to these pieces, not only would they be lost to future generations, but the potential knowledge they offer would never come to light. Their destruction would be complete, as if they had never existed. and the land will live by uproar…. what comes from the mouth cannot be endured. Shrunk is the land–many its controllers. It is bare–its taxes are great. and it is poured out in rising amounts. The Sungod separates Himself from mankind. With all of the ongoing change happening in Egypt right now, there is the danger that what has existed there for millennia could be lost in just a moment. While the people have been fearlessly standing up and making their voices heard, the fire and chaos in Cairo has been threatening the Museum of Egyptian Antiquities. Reports coming in via Twitter told of the protestors forming an incredible human chain around the museum to protect it until the army could come to take over. Now tragicÂ reports have come in from Dr. Zahi Hawass himself of some damage by looters and the destruction of at least two mummies. With the continuing upheaval, I am fearful for both the people of Egypt and the vast repository of beauty, wisdom, history, and monumental human achievement concentrated in that one building. Many know the museum as the home of Tutankhamunâ€™s treasures, the single greatest collection of burial goods from ancient Egypt, including not only the gold mask, but everything from chariots to underwear. But the museum holds so much more. 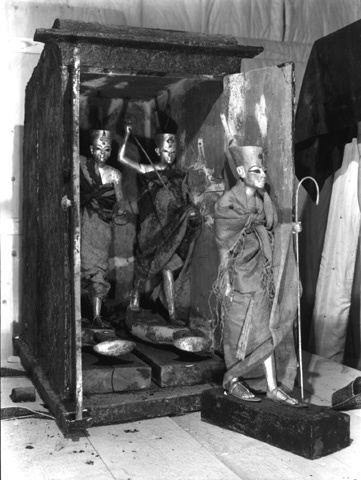 The magnificent models from the tomb of Meketre come from another time of transition in Egyptian history. Meketre served the king who managed to reunite the country after its first long period of decentralization. 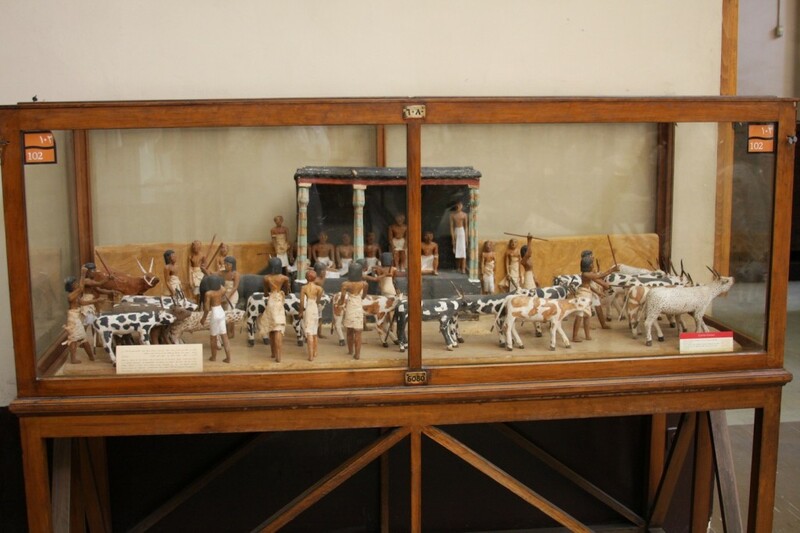 The enormous wooden model depicting cattle stocktaking is absolutely unique in ancient Egypt. The amount of detail in this, and other models, give us insight into daily life, ancient technology, and social relations. Even the bodies of the pharaohs themselves lie in state in the museum, like Ramesses III, who battled invasions by the Sea Peoples and whose wife, son, and officials conspired to assassinate him. 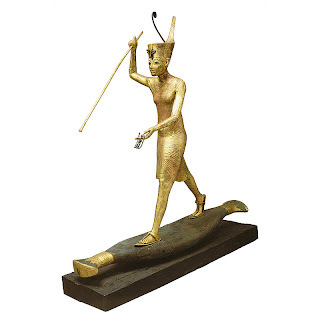 Bonhams’s recently had an Egyptian Revival sale and the pieces that were auctioned can all be viewed on the site here. Some wonderful pieces are actually directly inspired by real Egyptian artifacts, for example this chair modelled on the chair of Sitamun from the tomb of Yuya and Tuya as pictured here, while others provide comedy value with their extravagant over-blown design and heavy-handed interpretations of Egyptian design that bear little resemblance to their supposed origins. I also stumbled across a very interesting article, purely by chance, mainly about the Egyptian-inspired movie theatres of the United States but also touching on the history of Egyptomania itself. The entire article by Bruce Handy of Vanity Fair is well-worth reading, but the most gripping description is perhaps that of Grauman’s Egyptian Theater and its spectacular role in the very first ever movie premiere. Back in 1922, before the discovery of Tutankhamun’s tomb, when Hollywood was just a sleepy stretch of orchards dotted with a few fledgling movie studios and the joke was that ‘cannonball could be fired down Hollywood Boulevard any time after nine at night and never hit a soul’, it was decided that a movie theatre would be ‘the perfect anchor for commercial development. And not just any movie theater: it would be one of the most spectacular the world had ever seen’. ‘On October 18, 1922, with newspaper ads promising that â€œevery star and director in the motion picture industry will be there,â€ Graumanâ€™s Egyptian Theatre was unveiled in all its pharaonic splendor, playing host to the world premiere of Douglas Fairbanksâ€™s Robin Hood. Grauman’s ignited a vogue for Egyptian-themed theaters in America and in the 1920s some four dozen were built ‘bringing the glories of the Nile to exotica-poor locales such as Brooklyn, Denver, Seattle, Indianapolis, Houston, Milwaukee, and Ogden, Utah’. But why did the movie industry in particular seize upon Egyptomania so enthusiastically? The main reason is the obvious coincidence of timing between the discovery of Tutankhamun’s tomb and the birth of cinema. As Handy notes: ‘Of negligible import as a pharaoh, Tut nevertheless enjoys one of the ancient worldâ€™s highest Q ratings, right up there with Jesus, Mary, Cleopatra, and the first two Caesars. The discovery also unleashed one of the Westâ€™s greatest waves of Egyptomania… Filmmakers, then as now not immune to popular taste, released Tut-ankh-Amenâ€™s Eighth Wife and Tut-Tut and His Terrible Tomb, both in 1923. Tin Pan Alley staked its own claim with â€œOld King Tut Was a Wise Old Nut.â€’ However, I think there were several other reasons why Egyptian design became so popular a style for movie theatres and they lie in the nature of the movie industry at the time, how Egypt was perceived and what it represented to people. Movies were a way of transporting people, allowing them to use their imaginations and escape. Ancient Egypt had already been a popular subject for early filmmakers with five features about Cleopatra alone made between 1908 and 1918. Ancient Egypt was exotic and mysterious; by designing theatres in Egyptian styles, the cinemas themselves became fuel for the imagination, pure escapism in architecture. With cinema in its early stages, studios and theatres wanted to convince people of the industry’s stability and potential for success and longevity. What better association to make than with the eternal land of pyramids and temples? Also, the image Hollywood has always cultivated for itself is one of opulence, and it seems hardly coincidence that the first glamorous red carpet parade happened at the opening of Grauman’s Egyptian Theater, with its rich Egyptian style decor suggesting all the golden wealth of the ancient civilization that Hollywood wished to emulate. 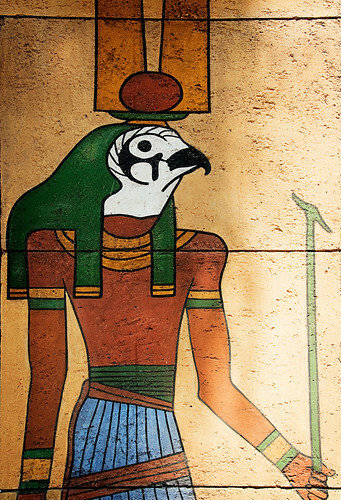 Using the motifs of Egyptian design was more than just an architectural fad, they could be used to convey a message to audiences and contribute to the image Hollywood studios wished to present. Although Washington didn’t get a pyramid from Congress, according to theater historian David Naylor, the flamboyant movie exhibitor Grauman gave him an even more bizarre memorial in his second downtown theatre, the Metropolitan: ‘a sphinx with the head of George Washington on a pedestal beside the lobby staircase. The quote near the base of the sphinx read, “You cannot speak to us, O George Washington, but you can speak to God. Ask him to make us good American citizens”‘. 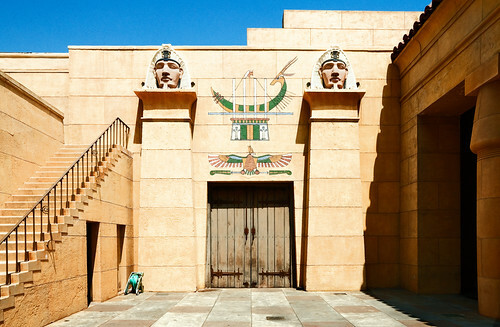 Although Graumanâ€™s Egyptian Theater has been restored and is currently the home of the American Cinematheque, of the 40 to 50 Egyptian theatres built in America in the 1920s, only a handful survive. The sad thing I find is that I can no longer imagine an Egyptian revival of such magnitude ever taking place again, or at least not one that would be taken seriously and valued for the elegance and energy of its design. The media, movie-industry, and disappointingly even the way Egypt and its treasures are promoted, have all contributed to some people’s view of Egypt not just as a stereotyped land of gold and mummies, but have also added tacky, over-the-top, crude, and laughable overtones to the way it’s perceived. Sadly some of the crasser examples of Egyptomania can also be said to have contributed. Despite the general public’s fascination with Egypt, their exposure is superficial, with few people able to tell the difference between crude inaccurate Egyptian-style reproductions and the real artistry of the originals. ‘Most of us have gleaned whatever knowledge we have of ancient Egypt from popular culture, whether Boris Karloffâ€™s The Mummy, Elizabeth Taylorâ€™s Cleopatra, Victor Buonoâ€™s King Tut on the old Batman show, Steve Martinâ€™s novelty song â€œKing Tutâ€ (in which the boy king moves from Arizona to Babylonia, where he owns a â€œcondo made of stone-aâ€), or Brendan Fraserâ€™s frantic Mummy remakes. Indeed, judging from these sources, youâ€™d be forgiven for thinking that ancient Egyptâ€™s was the silliest civilization that ever existed’. None of this is going to be changed anytime soon, if Egypt continues to be presented in a way that aims to appeal to the lowest common denominator with sensationalism rather than aspiring to a more informed representation. Commercialism feeds people’s misconceptions of Egyptian culture in an attempt to cash in and sadly one of the most disappointing examples of this happening is connected to what should be an opportunity to educate people. I think the marketing for the Tutankhamun exhibit at the O2 buys too much into stereotypes, trying to sell it on gold, gold, and more gold, and raising false hopes of seeing the famous death mask, rather than helping people see that viewing more domestic objects can actually give us more insight into the life of the boy king. I’ve even heard that the gift shop features a tissue box in the form of the famous mask, where the tissues come out of the nostrils! But I shouldn’t really judge until I’ve seen it myself. I’m planning to visit it at the end of March, and when I do I’ll let you know what I think of it. I believe that it’s possible to harness the interest in Egypt inspired by Hollywood and the media, and use it as an opportunity to introduce people to the real Egypt. Though exciting action and glittering gold can glamorize Egypt, it remains that this fascinating culture has intrigued people since ancient Greek and Roman times and will continue to in spite of the misleading publicity it gets. For those willing to actually take a close look at the objects and monuments or read about them will realize that it can be even more thrilling to pierce the veil of mystery that shrouds the *real* Egypt and to delve into the lives of the people who created this astounding civilization. For further reading on Egyptomania, I can recommend Imhotep Today: Egyptianizing Architecture, a nice collection of essays on examples from around the world. 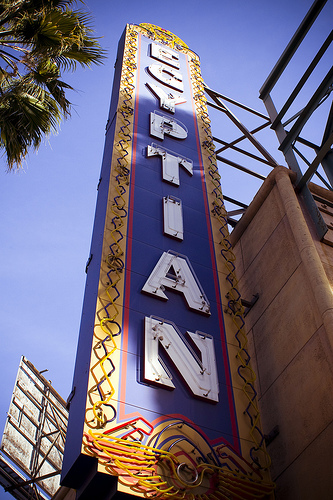 Sign for Grauman’s Egyptian Theatre. Photo by Kevin Stanchfield. Although I’ve travelled to Egypt a few times now myself, it always interests me to hear people’s first impressions of the country, especially when they are less familiar with the ancient society. Lynn Barber has written a delightful article in the Guardian on ‘how she fell for Egypt’, and it gives a wonderfully fresh insight on how the country and its landscapes, people, monuments, and artwork can captivate and capture the imagination so instantly and entirely. It’s wonderful to hear about someone else falling for the first time for something you love too and it makes me recall my first trip to Egypt. To me Egypt was a civilization that I already knew very intimately, but to finally be there, I was just as astonished as Barber, or even more so. I still vividly remember my first visit to the museum in Cairo. When I was a child, I delighted in the Egyptian gallery of the Royal Ontario Museum, but was awestruck when I finally encountered the more extensive collections of the British Museum and the Louvre- what treasure troves of wonder! But everything I had yet seen paled in comparison when I first visited the Egyptian Museum in Cairo. While the museum conditions are not ideal and the labelling is rather sparse, the collection of artifacts is incredible and not to be missed. Despite the rather shabby setting, I gasped in awe not just at each new room I entered, of which there was an astounding, seemingly endless number brimming with antiquities, but at each object that met my eye; many of them were familiar to me as significant pieces appearing in countless books, and the rest were new and thrilling, each one a tiny time capsule revealing some insight into the ancient Egyptians. From the imposing colossal statue of Amenhotep III and his wife Mut, who preside over the great statue court at the heart of the museum, to the thousands of tiny, delightful pieces stuffed into the rooms that tourists seem to ignore entirely in their dash for King Tut’s mask–they all made me fall in love with Egypt all over again. My first sight of the great hypostyle hall at the temple of Karnak was one of the few experiences in my life that’s been literally jaw-dropping, as in actually being unable to keep my upper and lower jaws attached. Karnak is the grand temple of Egypt, the one that every king had to add to until it became positively labyrinthine, and apparently the largest ancient religious site in the world. The hypostyle hall is its crowning glory: 134 massive limestone stone columns in the form of papyrus plants, some standing up to 80 feet high, form a veritable stone forest. I am sadly unable to find the words to describe the strange humbling yet inspiring feeling I felt standing dwarfed in the midst of that massive monument. I can only say, if you’ve never been, you need to go. On one point in Barber’s article I’d have to disagree though- she describes her visit to the Valley of the Kings and says that while the main ticket allows entrance to three tombs, ‘if you want to see more tombs, you can buy another ticket or go to the Valley of the Queens, and the Valley of the Nobles, but three is probably enough’. I can understand that seeing a myriad of tombs might be overwhelming for those new to Egypt and three tombs in the Valley of the Kings specifically might indeed be enough, but missing out the Nobles and the tombs of Deir el Medina is a mistake that many tourists seem to make- both were deserted when I visited. The tombs of the kings and the tombs of the nobles, and also of the workers who made the kings’ tombs, are very different in style indeed. The royal design is understandably quite formal and focussed on religious motifs, and personally I think that the average person would probably enjoy the tombs of the Nobles and Deir el Medina much more with their lively decoration and relate more to the scenes of daily life. The art in those tombs is truly superb and not to be missed. Actually, it’s hardly surprising that the artists who decorated the tombs of the kings did a rather wonderful job on their own tombs too! It was wonderful to read Lynn Barber describe Egyptian art in such glowing terms: ‘I expected to find ancient Egyptian art interesting: what I didn’t expect was that I’d find it as thrilling as, say, Florence or St Petersburg’. Sadly, Egyptian art has always historically been viewed as inferior to classical art, but I’m glad it’s not just the Egyptologists who’d disagree with this. I’m not convinced either by her claim that ‘most of the tour guides in Egypt are fully trained Egyptologists’ since sadly I’ve heard numerous guides spouting ridiculous nonsense to rapt audiences of tourists. I’ve met a number of the Egyptian summer trainees at the British Museum and they’re actually curators and antiquities inspectors not tour guides. Egypt can have a profound effect on its visitors, however Lynn Barber’s final comments in her article were incredibly amusing to me as an Egyptologist-in-training who decided on her career at the age of 6. Unfortunately Barber’s words of wisdom come perhaps slightly too late for me: ‘Incidentally if you have children of an impressionable age, do not take them to Egypt because it will inevitably make them want to become archaeologists when they grow up and then they will spend their adult lives sorting shards in some dim county museum… Egyptology is an incredibly alluring subject, but a disastrous career, I suspect’. You’ve probably all heard about this story already since it broke in all the newspapers awhile ago. It wasn’t an April the 1st story, though you’d be excused for thinking it. The announcement that the Egyptian government was planning to pass a copyright law on its antiquities has flabbergasted just about everyone. Apparently the draft bill was formulated in the wake of attacks by the Egyptian media against the famous pyramid-shaped Luxor casino in Las Vegas. The newspaper Al-Wafd published an article stating that ‘Thirty-five million tourists visit Las Vegas to see the reproduction of Luxor city while only six million visit the real Egyptian city of Luxor’. (They fail to note that while the casino is called the Luxor, it has nothing to do with the city of Luxor and is actually a copy of the Great Pyramid at Giza located almost 700km away). So, at first glance, it appears that the entire point of this law would be to get a slice of the biggest, most successful exploiters of Egyptian cultural heritage. But then comes the strange twist in the whole story: the Luxor Casino would be exempt from the law, supposedly because it’s not an ‘exact’ replica, even though it is blatantly meant to represent the Great Pyramid and the Sphinx. According to Zahi Hawass, ‘It is a resort that doesn’t look like anything from antiquity, it is a replica of imagination, I can’t stop them from doing that’. Besides, “it is an ugly pyramid with fake hieroglyphics inside’. But why would places like the Luxor casino be exempt? If they’re not the target, then what is the point of the law and who would they be going after? If the reproductions have to be 100% accurate for the copyright to apply, how many objects will this actually affect? Such a law would just encourage businesses to make even more dreadfully ugly and inauthentic reproductions than they do already, just to avoid being accused of copying. Also, how would the Egyptians actually manage to enforce the law internationally? I suspect that the government would only really be able to enforce the law in its own country, and thereby only succeed in hurting its own economy, tourism being its primary industry. And if they didn’t enforce it in their own country, how could they justify going after anyone outside it? Deciding who copyright belongs to when the artists, craftsmen, and architects are unknown and so long dead seems like a minefield in itself. If artifacts are kept in museums outside of Egypt and have been there for centuries, does the copyright still belong to Egypt? The bill raises so many baffling and ludicrous questions and the whole concept seems to rest on very shaky ground. The way I see it, reproductions are actually free advertising for the Egyptian Tourism Board. In my experience, the plastic (rather grotesque) King Tut mask that my mom got me for Hallowe’en when I was a child only further fueled my desire to one day visit Egypt myself. Around the world, similar trinkets and architectural homages only remind us of the much greater wonders that lie in Egypt itself. In the International Herald Tribune, the lawyer Jeffrey P. Weingart states: ‘Anytime someone seeks to promote and profit from artistic or photographic expression, one walks a fine line between promoting its use on the one hand and protecting material on the other’. For a very amusing commentary on the copyright story, check out this blog entry at the Guardian entitled ‘Quick! Hide your pyramids!’. The Senior Copyright Counsel for Google has also written an interesting response to the issue at his blog: ‘You can walk like King Tut, but don’t copy him’. For more articles, check out Andie Byrnes’ brilliant blog where she has been rounding up all of the media coverage on the story. Very often, when people find out I study Egyptology, they excitedly tell me about how ancient Egypt was a passion of theirs when they were younger. It is always gratifying to see that so many other people share my enthusiasm for Egypt, but it is disappointing too to see so many of them misled by the media in their casual attempts to learn more. Anyone who has ever loved Egypt will always prick up their ears whenever the latest news story about a new discovery hits the headlines. However, many of these news reports fail to present a balanced picture. Generally, a new theory should be critiqued by peers and subjected to a certain amount of analytical scepticism before it is accepted. Apparently this is beyond many news publishers, at least when it comes to Egyptological stories. It seems like all it takes these days is issuing a press release. Iâ€™d been thinking about writing about this topic for a while, when the story about the â€˜discovery of Hatshepsutâ€™s mummyâ€™ broke. The treatment of the item in the Guardian, a UK paper I generally enjoy reading, left me horrified. Hatshepsut is famous as a woman who became pharaoh of Egypt, taking control of the country and portraying herself using male royal iconography. Her magnificent funerary temple is located at Deir el-Bahri, but her body was never been found. Zahi Hawass, the head of Egyptâ€™s antiquities, has announced that a previously unidentified mummy may be Hatshepsut. While it is possible that this may be true, the announcement seems slightly hasty. The evidence does not seem conclusive and Iâ€™d like to hear more information before I make up my mind about the matter, but thatâ€™s not the point here. The article in the Guardian though presents the matter as concrete fact, and then goes on to present contradictory statements from the researchers. 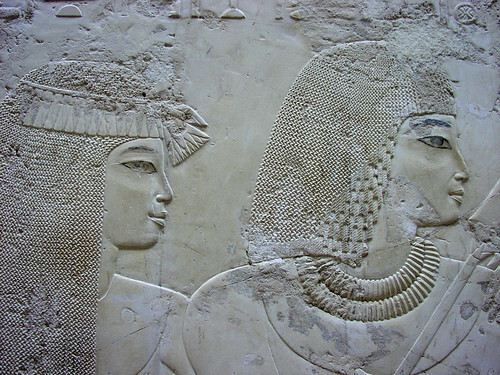 The title of the article is the very definitive statement: â€˜Mummy is missing female pharaohâ€™. 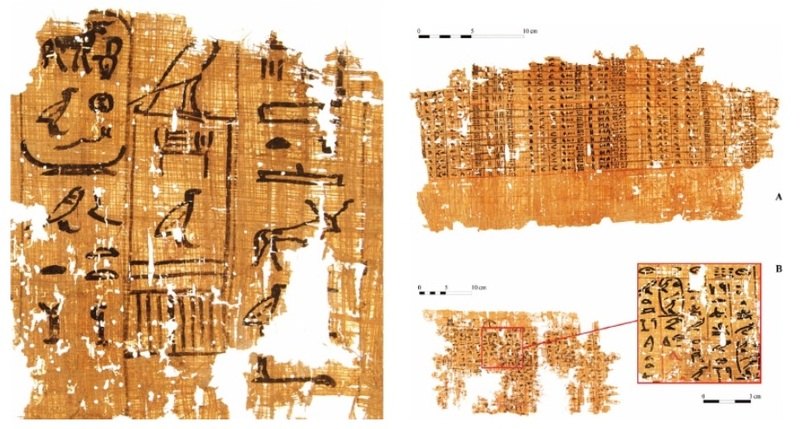 The author seems thoroughly convinced when she states unequivocally: â€˜Egyptian authorities confirmed yesterday that thanks to DNA analysis and an ancient tooth, they have identified a mummy found a century ago as the remains of the pharaoh Queen Hatshepsutâ€™. She quotes Dr. Hawass as saying, â€˜We are 100% certainâ€™, but then goes on to say that the DNA testing has not actually been completed: â€˜While scientists are still matching those mitochondrial DNA sequences, Dr Gad said that preliminary results were â€œvery encouragingâ€â€™.Â Whatever â€˜very encouragingâ€™ means in terms of results, it certainly cannot be the categorical proof that the article suggests it is at the beginning. I very much doubt that it would stand up in the general scientific community. The article also fails to note that the Discovery Channel wanted to find Hatshepsut for the purposes of a documentary programme and that the study was funded by them. While I know that journalists are not afforded the same sort of opportunity for editorial criticism in their writing, I hope that they arenâ€™t all quite as lacking in critical approach and can take a less blindly accepting approach to news stories. Unfortunately, this isnâ€™t an isolated case. For example, a few months ago, a story about the Great Pyramid made news headlines across the world, and prompted a couple of my friends to approach me concerning what I thought about the â€˜discoveryâ€™. The general idea theyâ€™d been given by newspapers and websites was that the question â€˜how did the ancient Egyptians build the pyramids?â€™ had finally been answered once and for all. The headline of the article on the BBC was: â€˜Mystery of the Great Pyramid â€œsolvedâ€â€™. The impression given by the title is incredibly misleading, even though there are quotation marks around the word â€˜solvedâ€™. The article gives the impression of simply being a regurgitated version of the theoristâ€™s press release. Using a few more cautionary words to indicate that the theory was merely yet another addition to an ever-growing catalogue of hypotheses concerning the building of the pyramids wouldnâ€™t have gone amiss. The BBCâ€™s website only offers short pieces highlighting main news stories, however, with an enormous international audience they wield a great deal of power over peopleâ€™s perception of the news, and they shouldnâ€™t just offer up as fact whatever theories are sent their way. I donâ€™t expect journalists to be experts on ancient Egypt, but when the general population recognizes the authority of a respected news source as proof of a storyâ€™s validity, I wish they would be a little more careful about how they present their idea of whatâ€™s going on in Egyptological research. For many people, the news is one of their only sources of information on Egypt, and itâ€™s not very encouraging that their perceptions can so easily be manipulated by the media savvy and compliant news services. The ancient Egyptians had their share of official propaganda, but that shouldnâ€™t mean we have to too.